Have you experienced a burst pipe in your Wayne home or office? Act quickly! Water damage from burst pipes can get very expensive the longer you wait. First, shut off your water. Then call Jersey Pro Restoration LLC. The faster your response, the lower your chances of devastating water damage sustained. Jersey Pro Restoration LLC has been restoring properties that have water damage due to ruptured pipes in Wayne since 2013. Our crews take pride in speedy response times and will quickly contain the damage and restore your property. Burst Pipe in Wayne, New Jersey? If a pipe has burst in your building, call the restoration experts at Jersey Pro Restoration LLC today. We have been repairing burst pipes in Wayne since 2013 and ready to assist you as well. When you call (973) 291-1321 for a free quote to fix your ruptured pipe damage, you'll receive prompt, professional service and a free written quote. The longer it takes to contain the leaking water, the greater the water damage. 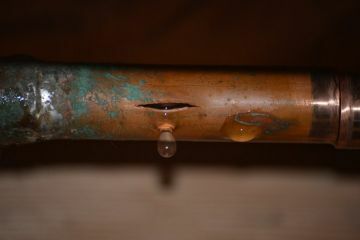 Call Jersey Pro Restoration LLC ASAP to fix your burst pipes! Timing is critical! You need a restoration company that will arrive quickly address the problem. If you have experienced a pipe rupture, first turn off your water supply, then call (973) 291-1321 for a speedy response and sound solution. We’ll find the source of the broken pipe and determine the extent of the damage sustained. Next, any necessary repairs or replacements will be made. Then, we'll restore any water damaged areas to their original condition. When you call Jersey Pro Restoration LLC you'll receive complete restoration service to fully recover your property. Aging, Corroded Pipes in Wayne? Pipes can burst from freezing temperatures or clogging caused over time. Contaminants and mineral deposits cling to the insides of pipes, narrowing them obstructing the flow of water. When pipes become clogged, pressure increases until eventually the pipes leak or rupture, spewing water in your flooring, walls, and possessions. If you’ve experienced a burst pipe, first turn off your water. Then call Jersey Pro Restoration LLC at (973) 291-1321 for fast action to fix the problem and restore your property. We’ll determine the source of the problem, and identify other pipes that may be compromised. Portions of the pipe will be replaced as needed. Last, any water damage sustained will be remedied. 5★★★★★ - "I was very pleased with the prompt, professional and high quality service of Jersey Pro Restoration. They were knowledgeable, courteous and cleaned up after their work as if they weren't even in my home. Most importantly I appreciate the availability of the owner by phone and text to answer any questions and concerns and put my mind at ease about the work being done. All these qualities put together, I would not hesitate hiring them again should their services be needed." 5★★★★★ - "Great company. Ben came out, inspected the situation and gave the proposal. They were very fair in the pricing compared to other companies. They were quick to schedule the work. When the work started, it turned out to be a major project. But Ben was quite fair in the revised pricing. Communication was good. His crew is very honest, polite and hard working bunch of people. Would definitely recommend this company for any mold remediation work." 5★★★★★ - "Reliable, personable, professional, reasonable and reassuring! The owner and his staff provided one of the best experiences we have ever had with any service provider They went beyond what was expected by far!" 5★★★★★ - "The Owner and Crew were some of the most respectful and clean people. They went the extra mile every step of the process. They worked hard and fast and took care of the problem. I had zero concerns and earned my trust through their word AND their work." 5★★★★★ - "AAA+ would use them again in a minute. Ben the owner and Anthony and the crew are fantastic!" 5★★★★★ - "Prompt, courteous, conscientious. A pleasure to have a company follow-thru in a timely fashion. Great communication. Work ethic is a "10"!" 5★★★★★ - "Ben and his staff were respectful of our belongings and of my daughter and myself. They were prompt, courteous, knowledgeable and cleaned up as if in their own homes. Truly appreciate all of their hard work and kindness." 5★★★★★ - "Everything was perfect and timely finished the job." 5★★★★★ - "We hired Jersey Pro for mold remediation in our bathroom. Our fan has not been properly working and is not in the correct position, but before we move and replace it, we hired Jersey Pro to check and remediate the mold that had surfaced on our ceiling and around our skylight before we repaint and install the new fan. Bel said on the phone that the ceiling may have to be taken down if the mold is bad. But when he saw it, he determined it was surface mold and that it could just be removed. Very quick service, prompt and courteous. He didn't try to swindle me into needing other services like other mold companies were seeming to do on the phone. No scare tactics. Mold is mold is what he said and I agree. Highly recommend." 5★★★★★ - "Professional, knowledgeable and timely." 5★★★★★ - "They kept appointments. Their work was efficient, thorough, and they cleaned up afterward. All the workers were polite. It was a pleasure working with them." 5★★★★★ - "Jersey Pro Restoration is the best company to remove mold from the attic. They provided the best price for very high quality work. Two more estimates to clean my attic were about 3 times as high. One company did not even take the project because the attic was hard to get to and has very limited room to move. The best compliment was provided by the attic insulation company. They said my attic was the best they have ever seen and asked for the Jersey Pro Restoration card and contact information. I am very impressed with the quality of work and the results and highly recommend Jersey Pro Restoration for your house and will hire them again." 5★★★★★ - "Very thorough job and a better price than another company estimated. I would hire again." 5★★★★★ - "The crew is still helping us recover and I can't say enough about Tony and the entire team. Every day they came to check on my family. They are the nicest, caring, and most hardworking guys. They have been all over my neighborhood in Little Falls after the flood last week. Thank you guys for everything." 5★★★★★ - "I used Jersey Pro to rid mold in my upper attic when found on a home inspection. Ben came, gave me a reasonable price and got the job done. They were prompt and efficient. I highly recommend them to anyone." 5★★★★★ - "They showed up on time and did a great job of cleaning the mold in the basement." 5★★★★★ - "He was fantastic." 5★★★★★ - "I hired Jersey Pro to remove mold and to perform the reconstruction work. On the day of mold removal Ben's guys were prompt; they worked efficiently and were very friendly. On the reconstruction side the workers were are again friendly and accommodating but required more supervision having to stay on top of them more. It may also seem this way because it was not a quick repair and move on, but a renovation. if I were to do it again I would still use them." 5★★★★★ - "So far I am very impressed with this young mans business sense. He showed up when he said and didn't appear with a doom and gloom story. Mold is bad enough, so others had given me the feeling of knots in my stomach , where I am usually there to calm others.Bel the owner, was realistic while not being over powering. I am an electrical contractor and never scare anyone into business, just layout and educate my customer and tell them what needs to be done to repair and assure them that if I do it , it would be the same as if I was doing for myself, Bel , the owner gave me that same sense." 5★★★★★ - "Jersey Pro is one of the best and honest no nonsense contractors I have ever hired in more than 20+ years. They were very responsive to every question and concern, and did not prey upon our concerns to sell unnecessary services. I would highly recommend Jersey Pro to any contractor or homeowner." 5★★★★★ - "They did a very good job. I appreciated the fact that the owner took the time to walk me through their process. Definitely would recommend them." 5★★★★★ - "I would work with them again." 5★★★★★ - "They did a good job. They did exactly what I asked for." 5★★★★★ - "He was very good. They had a very busy schedule. They did the work very quickly. They work pressionally."